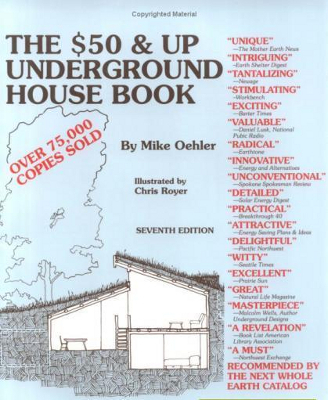 When I mentioned that one of our long-term plans is to have a flood/tornado/guest underground shelter up on the hillside, a couple of you recommended Mike Oehler's The $50 and Up Underground House Book. I'm glad I checked it out, even though (for reasons I'll mention in a later post), we probably won't use this technique for that structure. My first reaction is that Mike Oehler's book feels like Walden for the twentieth century, both in good and bad ways. I enjoyed the under-building principle, but noticed that the author put in an enormous amount of physical effort to create a structure that focuses more than I think necessary on elegance. Oehler's writing is also opinionated verging on snarky, which some folks (especially those who enjoy Salatin's later writing) might find amusing, but which turns me off. Finally, there's quite a bit of theorizing that isn't necessarily backed up by experience or data. On the other hand, if you throw out 25% of what Oehler writes, the remaining 75% is thought-provoking and helpful. In fact, I could see the book being entertaining reading even if you're not thinking of building an underground house and would simply like to see how one back-to-the-lander from the 1970s made his home. Stay tuned for the tips I took away from the book in later posts in this lunchtime series. To read more about my theories on underbuilding and simple housing, check out Trailersteading.